The following account covers the first part of the 13th Representative Assembly of the Confederation of Democratic Simulators (CDS), from April to July 2010. During these few months, I was still active in CDS. It is thus fairly easy for me to reconstitute the main events. On 22 April 2010 Delia Lake, acting in the name of the CDS Scientific Council (the Judiciary Branch), declared that the deadline for announcing candidacy for the next RA elections was 30 April 2010. The atmosphere in CDS at that time was particularly tense. The conflict between one group of long-time CDS members and another group of long-time Al Andalus members was heating to the boiling point. I think I first realized that the merger might fall apart when I read the 30 April forum post “We need to talk” by Patroklus Murakami, in which he compared the merger to a failed love affair. Part of the divergence was in different approaches to democratic discussion. CDS has always operated as a very formal democracy with its Representative Assembly, where only the elected representative can vote, and which names various Commissions to discuss current issues. Al Andalus preferred informal consensus decision making, where all interested citizens were invited to discuss the issues at “Town Hall Meetings.” It is instructive to scroll down this list of meeting transcripts from 2010 posted to the CDS forum in the first half of 2010, in which there are nearly as many Town Hall Meetings as RA meetings. The last Town Hall Meeting on this list is dated 2 May 2010 – and I can’t find evidence that there were any others after that. On 01 May Sonja Strom called for the traditional Candidates Debate for the May Elections. She noted that up until then CDS elections were held on a party system, where voters chose a party or “faction,” rather than individual candidates. Each party named one of its candidates to represent the faction, and the debates were held between the faction representatives. But the electoral law had just been changed, and for the first time citizens would vote for individual candidates rather than for parties. The 15 candidates were listed here. The “debate” seems finally to have been organized as a Meet the Candidates Pajama Party on 16 May 2010 – although I was unable to find any transcript of it. The last meeting of the 12th RA seems to have been that of 9 May 2010 (the transcript was posted in three in three parts, which can all be found here). On 10 May Delia Lake, as member of the Scientific Council, flagged the referendum question concerning the merger, which the RA had decided on 9 May 2010 to put on the ballot. The referendum question was: "Do you want the merger between the CDS and Al Andalus to become permanent?" (A member of the SC may flag legislation by posting a notice to the effect that an SC review is desired, with a brief justification.) The SC apparently reviewed the question and decided that it could indeed go on the ballot. On 11 May Delia Lake posted the New Rules for Election Campaigning. I can’t find on the forums the announcement of when the polls would open and close, but on 23 May 23 Delia posted the Election Results. The winners were: Arria Perrault, Cindy Eksol, Gwynneth Llewelyn, Kasiedo Quandry, Lilith Ivory, Muhammedyussif Wikinger, Patrolkus Murikami, Pip Torok, Rose Springvale, Solomon Mosely, Stuichicanne Darkstone, Timo Gufler and Tor Karlsvalt. The results for the referendum question were: 23 votes for, 17 votes against, and 16 unanswered. Thus according to the referendum, the merger was to be permanent. A few hours after the election results were announced, Cindy Ecksol summarized a question (which had already been raised by Arria Perreault), concerning the procedure for selection of the Leader of the Representative Assembly (LRA). In the past, the top vote-getter in the winning “faction” was automatically named LRA. This meant that the LRA was appointed before the first RA meeting was held (and the other new representative sworn), and could begin immediately get to work setting the date of the RA meeting, preparing the agenda, and soliciting candidates for Chancellor. But under the new voting system, there was no LRA until the new representative could meet to select one. Could the new RA “meet” informally before being sworn for the purpose of organizing itself? This question (an example of the type of arcane topic that can be endlessly discussed on the CDS forums) was apparently resolved by holding the first RA on 01 June, which date was pre-set by the legislation (but which fell on a weekday, which was inconvenient for some new representatives). On May 31, the day before the first RA meeting of the new term, Cindy Ecksol announced her candidacy for the role of Chancellor, joining Sonja Strom who had apparently already announced her own candidacy for Chancellor. The first RA meeting of the 13th RA was held on 01 June 2010, as per the official schedule. Since there was no LRA yet, the meeting was opened by Delia Lake, who proceeded to the swearing in of the new RA members. Once this was done, the discussion turned to the selection of the LRA. The RA members nominated two candidates: Arria Perreault and Rose Springvale. The assembly immediately split into two groups, which could be called the anti-merger group supporting Arria, and the pro-merger group supporting Rose. Or rather, one group contested the neutrality of Rose, as Estate Owner for Al Andalus and the founder of the non-profit corporation VDI which owns the AA sims, and the other group contested the neutrality of Arria, who had campaigned on a platform specifically opposing the merger. The underlying conflict seems to have been about whether CDS could be converted into a non-profit organization in order to take over the AA sims, which benefitted from lower tier as belonging to a non-profit. The tone got so aggressive that a vote was taken to stop discussing and vote for LRA. Arria received 6 votes and Rose received 7. On 01 June 2010, the same day as the first RA meeting, Kaseido Quandry submitted a Request to the SC to investigate the election. The issue raised by Kaseido was that Sonia Strom, in her role as Chancellor, had given certain candidates the power to send official group announcements concerning their candidacies. This issue was reviewed by the Scientific Council at its 9 June Meeting. The SC decided that Sonia as Chancellor had the right to give new candidates access to the group announcements, since candidates who were already members of the RA already had this access – and in a couple of cases had posted messages concerning their own candidacies. At this meeting the SC also nominated Callipygian Christensen as a new member of the SC. The next few weeks were deceptively calm. The new RA set to work on practical matters, seeming almost to forget the conflict about the merger. At the the RA meeting of 12 June (see the Summary of Actions posted here) Callipygian Christensen was given the RA vote of confidence to serve on the SC. A Communications Commission was created to explore communications options and recommend legislation, and a Finance Commission was created to explore financial needs of the sims and recommend legislation. The vote for Chancellor was inconclusive: Sonja Strom and Cindy Ecksol both received 4 votes, with several “7 day votes” (requested by RA members who could not make the meeting). When the 7-day votes were counted later, Cindy and Sonja both had 6 votes (with 1 abstention), so there was still no Chancellor. At the RA meeting of 17 June (see the Summary of Actions posted here another attempt was made to elect the Chancellor: Sonja and Cindy were again tied at 4 votes each, with several 7-day votes outstanding. Several more Commissions were created: an Election Commission to clarify procedures, a Commerce Commission to address issues of businesses in CDS sims, and a Citizenship Commission to review the rules of citizenship and make recommendations. Jamie Palisades volunteered to write a proposal for a Covenant Review Committee (no motion at this time), and steps were taken towards the creation of a Committee on Ethics and Conflicts of Interest. Jamie Palisades initiated a discussion regarding an operating agreement for the Al Andalus sims, which ended with a suggestion to have three representatives from CDS meet with the VDI board. This last suggestion led to the Special Meeting of RA and Board of VDIheld on 21 June 2010 (the transcript is here. At this meeting Rose Springvale, Delia Lake and Micael Khander, the three members of the Board of the non-profit organization VDI, tried to explain the formal mechanisms underlying the merger. Linden Lab recognizes only two kinds of sim owners: the first is a single avatar who owns a private sim, which is the case for the 5 original CDS sims, owned by Sudane Erato. The second is a real-world nonprofit corporation, which is the case for Al Andalus, owner by VDI. According to LL, the Estate Owner (EO) of a private sim is an avatar who has the right to sell the sim, but the owner of a non-profit sim is the non-profit organization, and no individual avatar has the right to sell it. Arria Perreault pointed out that CDS law fails to recognize the second type of Estate Owner (EO), and Rose replied that the SC was reviewing whether the CDS Estate Owner law could be changed. 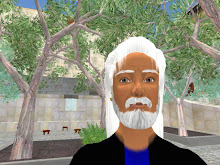 Rose explained that Sudane could keep owning the five original sims while VDI owned the 6 AA sims, with a contract between the legal representative of CDS (the Chancellor) and the Executive Director of VDI - unless CDS created its own non-profit. (The initial merger agreement in fact foresaw that a new non-profit would be created to own all the sims.) Arria replied that many people are opposed to having VDI play the role of EO for the whole of CDS. Others present at the meeting worried what would happen if VDI broke the contract, or suggested that a non-profit would mean a loss of control, with suspicion of Rose’s motives. But if one reads to the end of this transcript, one gets the impression that Rose wanted Al Andalus to be integrated into CDS as the only way to save the 6 AA sims. And perhaps all the various objections of the CDS core group were basically a rejection of this additional responsibility. (Al Andalus finally closed on 6 June 2012). And then came the surprise. On 22 July 2010 Micael Khandr posted on the forum an Announcement of Decision to Separate AA from CDS. Micael reported that the Al Andalus community had held two separate meetings on 21 July 2010, attended by approximately 30 individuals from both AA and CDS. The majority had decided to separate the sims. VDI as owner of Al Andalus therefore officially notified the government of CDS that it had elected to separate from CDS, and that AA would work with CDS to assure a smooth transition. So that was it: the merger had failed. Looking back now on that one-year period of the attempted merger, I am struck by how rich it was in innovations for CDS. Life in CDS went on. But I personally was stunned, and my participation dwindled. A few months later I expressed my disillusionment in a post on The Limits of Virtual Democracy. I stopped participating in CDS. For the past few years I have come in-world once a month, just long enough to pay my CDS tier. But the wheel turns, and I’m back.